With a pelt the soft shade of buff, Wingu is a bit paler than most lions you'd expect to see on the savanna. This already light coat fades still further to almost pure white which frames his eyes, muzzle, belly and the tips of each of his toes. A stripe of creamy brown extends along the path of his spine, ending at the base of his tail. A few other points of this brown mark his all-together too pale hide, showing in a single spot on his nose and the fringe of his inner ears. Green-blue eyes peer out from beneath dark eyebrows, lending him a curious, and somewhat rakish appearance. Toned muscles move beneath his fur. His entire form seems drawn out and elongated in both height and length, but also lacks in the raw bulk that some lions carry. Instead, it leaves Wingu with a lean, athletic build. 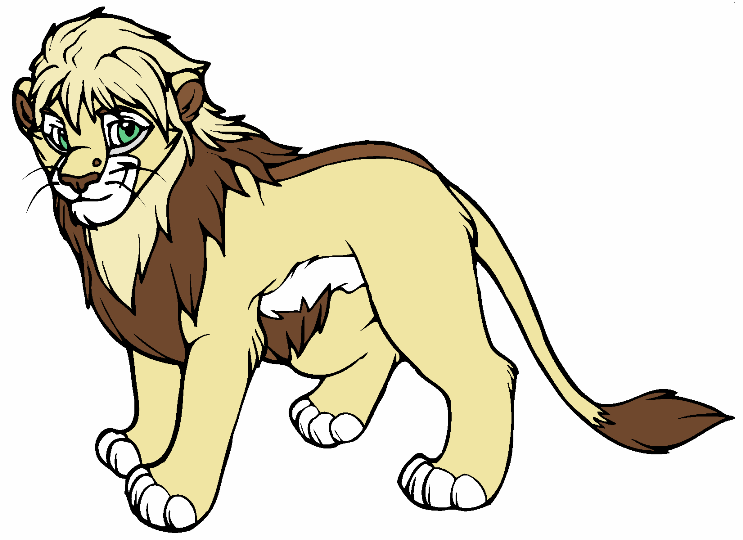 His mane, on the other hand, seems just that much more full in contrast to his wiry frame. Long strands start in the same color as his fur, pale and whispy as they dangle down to frame his face and neck. Then, they darken to brown at his shoulders, stretching across his chest. Where some lions' manes may stop there, his continues nearly halfway down his belly. Even the tuft at the end of his tail seems a bit thicker than on others, the entire effect making him seem just as fluffy as the clouds that are his namesake. Wingu has finally started to grow into his scruffy oversized features, but he still has a pale fluffiness that fits with his name. His fur is the soft shade of buff, leaving him a bit lighter than most lions you'd expect to see. This already light coat fades still further to almost pure white around his eyes, muzzle, chest, and at the tips of each of his paws. The fur along his head, neck, and chest has grown considerably and seems likely to expand further in time. The long strands start in the same color as his fur, pale and whispy as they flitter down to the sides of his face and onto his upper chest. Then, they darken to brown at the base of his neck and down onto his belly where a few brown fringes have latched onto his elbows. A stripe of matching color extends down along his spine, fading out at the base of his brown-tipped tail. A few points of darker brown mark his nose and inner ears, giving contrast to the rest of his all-together too pale coat. Time has elongaded his form, leaving him a bit gangly and thin and lacking the raw bulk of an adult. Blue-green eyes peer out from beneath dark eyebrows, lending him a curious, and somewhat rakish appearance. With the scruffy fluff and oversized features, Wingu certainly fits his name. His fur is the soft shade of buff, leaving him a bit paler than most youngsters you'd expect to see. This already light coat fades still further to almost pure white around his eyes, his small muzzle, down along his chest, and at the tips of each of his oversized paws. The once sparse fur along his head and neck have grown into a true pre-mane, sticking up in every direction regardless of how often it may be groomed. Those strands are tipped each with a touch of brown, perhaps giving some clue to the color of his mane as he ages. A stripe of matching color extends down along his spine, fading out at the base of his brown-tipped tail. A few points of darker brown mark the boy's nose and inner ears, giving contrast to the rest of his all-together too pale appearance. Blue-green eyes peer out from beneath dark eyebrows, seeming curious, yet cautious about a world he's yet to fully understand. 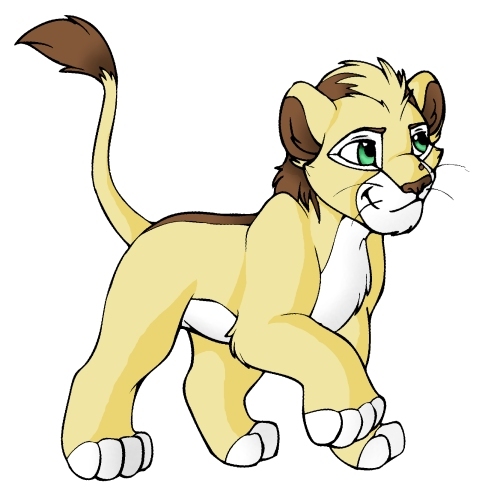 With the scruffy fluff and oversized features of a young cub, Wingu certainly fits his name. A downy layer of soft golden tawny fur covers this young lion. His already pale coat fades still further to almost pure white below his eyes, around his small muzzle, down along his chest, and at the tips of each of his oversized paws. The fur along his head and neck seems a bit longer than normal, sticking up in every direction regardless of how often it may be groomed. Those strands are tipped each with a small touch of ruddy brown, perhaps giving some clue to the color of his mane as he ages. A stripe of matching color extends down along his spine, fading out at the base of his small brown-tipped tail. A few points of darker brown mark the boy's nose and inner ears, giving contrast to the rest of his all-together too pale appearance. Blue-green eyes peer out at the world as if it were full of unknown wonder. The second-born cub of Kasjari and Mzohari's first litter, Wingu developed vocal skills long before his movement caught up with his growing mind. Where-as his brother had always been better at getting around, Wingu was better at talking. He loved to listen to the older lions have conversations, generally more curious about social interactions than about the outside world. However, with the influence of his brother, he certainly became a bit of a rascal once the two could get around. However, other events in the pride also shaped Wingu as he grew from a cub into a juvenile. The kidnapping of Gadi and loss of Kiokota made him far more aware of the dangers outside the pride, and lead him to feeling as if he were responsible for protecting the younger cubs. Of course, his parents instilling the idea into him didn't help much. This made it just that much harder for Wingu when he came down ill and was unable to go far from the shaded patch the pride called home for nearly a season. While other cubs were claimed by the sickness, Wingu managed to survive, barely. The illness left him a bit behind other cubs in the pride physically, and left him questioning his own future and place in the pride. As an adolescent, it became an effort in futility to catch up to the other males who were born around the same time. Even as he grew, he never did fill out quite as much as the others, growing lean and athletic rather than bulky and powerful. As he grew older, his training began to change as well. With time spent learning to guard the borders, Wingu was left to ponder if his fate would be better off sought elsewhere. 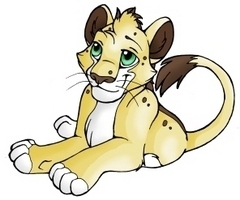 However, his mother and father decided to take all the youngsters of the pride to the volcano to learn more survival skills, and for the first time in his life… Wingu missed his home. It was there that he learned that his childhood best friend was in love with his brother, and upon returning home, that Korzar was named heir to the Kopje throne. For now, with an uncertain future, Wingu remains in his father's pride, trying to find a place for himself.